What if I purchase an eBook or eCourse and change my mind? Can I get a refund? There are no refunds available on eBook or eCourse purchases. Since you are purchasing a PDF file, once the purchase is complete and you've received the file, there's really no way to "return" or "exchange" it (even if you let us know that you've deleted it). If I bought the original Ultimate Silhouette Guide ebook or paperback do I get The Ultimate Silhouette Guide Second Edition for V4 free? No…but those who have purchased the original USG ebook you can get a 15 page free update to help with the transition to V4. Just email to request it. The Ultimate Silhouette Guide Second Edition for V4 is just like any of our other ebooks - it’s a new book that contains information specifically on Silhouette Studio V4. Not only have all of the screen grabs and information been updated and improved upon, we’re also now including almost 2 hours worth of video instruction making this a full blown course. 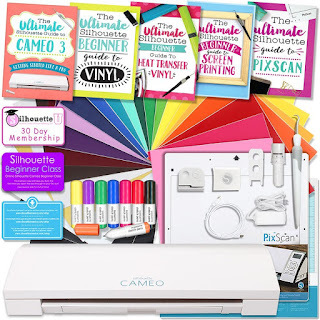 Similar to when Silhouette America released the CAMEO 3 after the CAMEO 2, the Second Edition of The Ultimate Silhouette Guide for V4 is a new product brought to the market. How do I open the eBooks and eCourse on my iPad? Install the Kindle app or iBook on your iPad. When asked if you want to open with iBook or "other", click 'other." Pick Kindle from the list of options. Then you can go to the Kindle app and read it! Can I gift the eBooks? Yes! We offer the option to gift all of our eBooks and eBook bundles. Click here for more on how to gift the eBooks! The copy center says they can't print the ebook because it's copyrighted. What do I do now? Please contact me at SilhouetteSchoolBlog@gmail.com and I will send you a written consent giving the purchaser the right to have the book printed. Is there a discount if purchase more than one of your ebooks? Yes! The more ebooks and eCourses your purchase - the greater the savings! Check out our full shop here. Is The Ultimate Silhouette Guide really worth the money? Who better to tell you if it's worth the money than those who've already purchased it? Read reviews from customers and Silhouette users who've purchased The Ultimate Silhouette Guide. 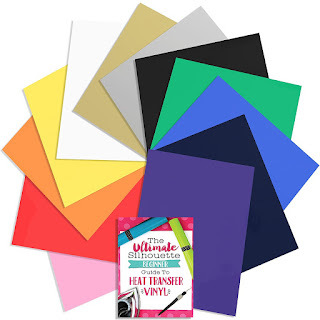 Is there any difference between the paper back copy and the ebook version of The Ultimate Silhouette Guide? 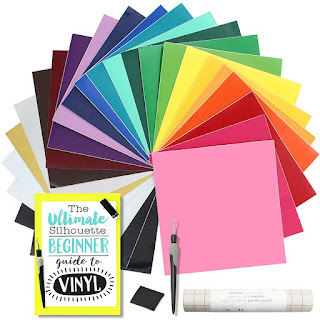 Is the Ultimate Silhouette Guide to Designing in Silhouette Studio, The Ultimate Silhouette Print and Cut Guide, or Cutting a Profit available in a paperback? The Ultimate Silhouette Guide to Designing eCourse, The Ultimate Silhouette Print and Cut Guide, and Cutting a Profit are only available as a digital download which will be delivered as a PDF. However, you are welcome to print the ebook at home or at a copy center. If you need a print consent, please email Melissa@SilhouetteSchoolblog.com. What's the difference between the original Ultimate Silhouette Guide and The Ultimate Silhouette Guide to Designing in Silhouette Studio? 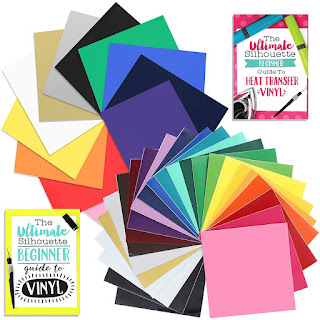 The Ultimate Silhouette Guide: Tutorials, Tips and Troubleshooting is a complete written reference guide to using your Silhouette cutting machine from getting it out of the box to cutting your choice of materials. The Ultimate Silhouette Guide to Designing in Silhouette Studio is a written and video eCourse which focuses exclusively on how to design shapes in Silhouette Studio. It should be treated as a course rather than a reference and is best utilized when completed in progressive order. Is The Ultimate Guide to Designing in Silhouette Studio eCourse really worth the money? Not only do we think The Ultimate silhouette Guide to Designing eCourse is worth the money - we think it's a steal. Given the amount of written content and the more than 3.5 hours worth of video instruction, if we broke it all out and sold it separately the value would be upwards of $100! How do I access the videos included in the The Ultimate Silhouette Guide to Designing in Silhouette Studio eCourse? The videos are all linked from within the eBook. Simply download the ebook not your computer and you'll find clickable links to the video tutorials. We've also written out the hyperlinks so you can type them into your browser if you decide to print out your ebook. Can I download the videos included in The Ultimate Silhouette Guide to Designing in Silhouette Studio eCourse onto my computer? The videos including in The Ultimate Silhouette Guide to Designing in Silhouette Studio Guide are available for unlimited online streaming. Due to the length and large size of the video files, they can't be downloaded. By making a purchase of a product from www.ultimatesilhouetteguide.com ("the Site"), you ("the User") are agreeing to the terms and conditions below. If you do not agree with the Terms and Conditions below, you should not make a purchase from the Site. There will be no refunds, partial refunds, or exchanges after a purchase is made. All sales are final. You may not license, teach from, distribute, or share copies of items purchased from the Site with any other person, business, or entity for personal or commercial use. The use of items from the Site is intended for use of the User for personal use only.